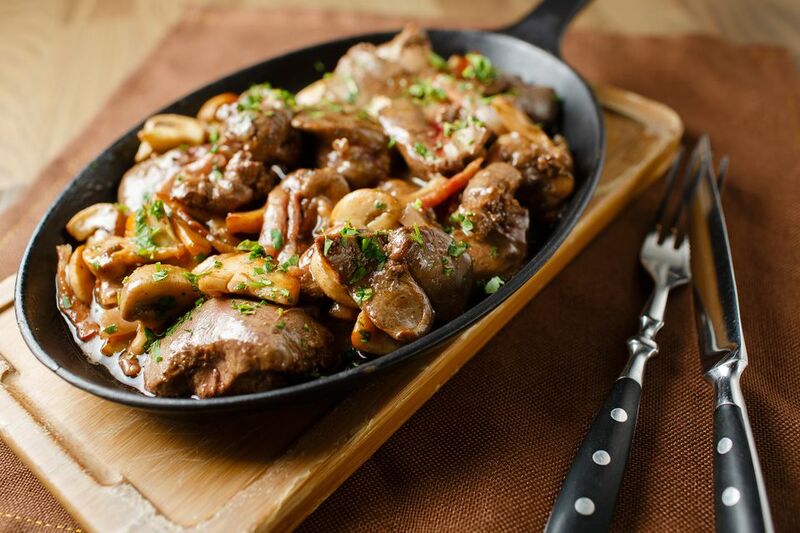 This recipe for chicken livers is an earthy combination of bacon, mushrooms, and green onions. Condensed golden mushroom soup makes a tasty sauce for the livers. If you aren't a fan of chicken livers but like the combination of ingredients, make the dish with boneless chicken thighs. Chicken thighs would go well with the mushrooms, bacon, and green onions. Chicken thighs also do well in the slow cooker and have loads of flavor. If you're looking for more ways to enjoy chicken livers, these rumaki bites make a delicious appetizer or snack. This dirty rice is another favorite dish. Cut chicken livers into bite-size pieces. Combine flour, salt, and pepper in a food storage bag. Toss the chicken liver pieces with flour mixture. Fry diced bacon in large skillet; remove when browned and crisp. Add the flour coated chicken livers, green onions, and sliced mushrooms to bacon grease in the skillet and saute until the livers are lightly browned. Pour the chicken broth into the skillet and cook, stirring, until the mixture is simmering. Transfer the chicken liver mixture to the slow cooker. Add the cooked bacon pieces, condensed soup, and white wine. Serve the chicken livers and vegetables over hot cooked rice, toast points, or buttered noodles.